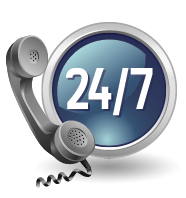 Available 24 hours a day, 7 days a week, and even including special holidays, Silverline Towing is a reliable, affordable and always-on-time towing company offering emergency towing services to all car owners in the East Bay. Always willing to serve the local community, our company is dedicated to providing you with the best emergency services wherever you may be in the city, tailored specially to your needs and the type of vehicle you have. We perform our services with the cooperation of an independently owned and licensed tow truck operators. Stuck in a car emergency in the middle of a busy highway? Worry no more! We are aware that since you’re always on the go, you might be overlooking simple but significant details about your car—how much gas it’s still running on, whether the engine has enough water, if the battery is still working, and so on. And it happens all too often that most emergencies occur when you’re in a hurry: when you’re already on the road and can’t afford to just leave your car and use public transportation. You don’t have to worry about any of these, though, because we’re simply one phone call away. Our licensed, skilled, and professional tow truck drivers make sure to always come on time and tow your car to the nearest automotive repair shop or gasoline station in the area. Got in a minor car accident? Let our roadside assistance specialists help you! Part of our emergency services are providing roadside assistance services for absolutely any type of situation you encounter while driving—overheated engine, dead battery, flat tire, broken ignition key, faulty brakes. In the case of minor car accidents or fender-benders, our roadside assistance specialists will haul your car off the road and towards the safety of the road shoulder as you settle accountabilities with the other party or your insurance company.